Quality Uni-Ribbon Satin Ribbon selection. Full colour selection available in 6 widths – 3 mm and 6mm width ribbons come on 40 m rolls. 9, 12, 19 And 25mm width ribbons come on 20 m rolls. Great quality, great value! 30% Discount for full roll purchase. Quality Polyester Satin Ribbon by Uni-Ribbon. 38Mm wide, 26 popular shades. Great quality, great value! Available cut to length required, full roll length is 20 m. 30% Discount for full roll purchase. Quality Polyester Satin Ribbon by Uni-Ribbon. 50Mm wide, 14 lovely shades. Great quality, great value! Available cut to length required, full roll length is 20 m. 30% Discount for full roll purchase. 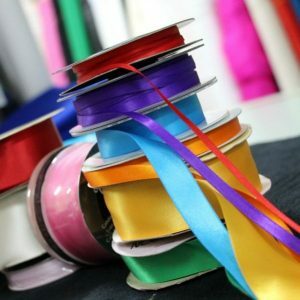 Quality Polyester Satin Ribbon by Uni-Ribbon. 75Mm wide, 7 useful colours. Great quality, great value! Available cut to length required, full roll length is 20 m. 30% Discount for full roll purchase.